Go Green: Does any of this make a difference? 4 Does any of this make a difference? Sometimes I think about giving up. I seriously throw my hands in the air and admit defeat. Green living is HARD and it seems like every single day we are learning something new and it sends us back to the drawing board Internet looking for alternatives. Did you know that recycled toilet paper is not as good as once thought? Here we all are preaching that you need to use products with recycled content and now we are learning that in fact this product can be bad for your health. You see many people put their thermal paper receipts into their recycling bin. Receipts contain BPA, which means that whatever that paper gets made into will now contain BPA. This includes recycled toilet paper and if you are using it it means that you are exposing your lady bits, man bits and baby bits to BPA. So all those times that Joe came home with non recycled toilet paper and I gave him my best 'COME ON! REALLY???' look...yah...I'm going to have to take that back now. Environment or Health. Which one wins? Today I read that chocolate can contain lead. Chocolate processed in 3rd world countries can contain the highest levels due to lead in the components of the equipment being used. Usually chocolate that is labeled as 'sustainably sourced' is a good key to it being produced in a 3rd world country. Delicious chocolate why have you betrayed me?? We shouldn't have to worry about lead in our food, especially when trying to buy sustainable options. We certainly shouldn't have to pick between environmental impact and our own health. And some days it just becomes too much. We do the best we can to reduce the impact we are having on the environment while also minimizing our exposure to toxic chemicals and when I read things like these two examples it can be very discouraging. So why are we all doing this? Why are we continuing to forge ahead and live a greener life? Because we can make a difference. Regular people like you and me fought the fight and WON. They stood up to a corporation and said NO, not in our neighbourhood. NO, you will not impact my life like this. NO, you will not contaminate my food and water sources. NO. Renewed faith my friends. Yes, there will be ups and downs and lessons learned about what is good for us and what is not. Let's just all do the best that we can with the resources we have right now and continue to fight the good fight for what we believe in. 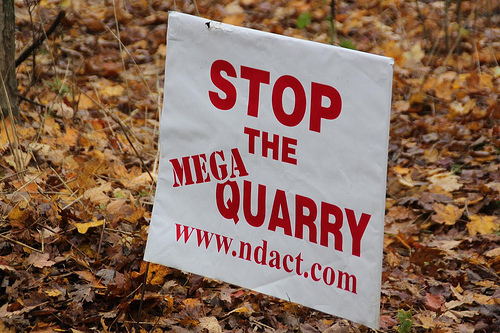 Learn more about the group fighting the mega quarry here. Oh I hear you! We live green AND I deal with the same thing with holistic nutritionist. I throw my hands up in the air thinking I am getting somewhere with a client or a reader in what's healthy and then BAM there will be a new study, new magazine article, SOMETHING that says "Oh green juices are giving people diabetes" and that client will go back to drinking coca-cola. This post REALLY spoke to me! Great job! All who fight an uphill battle to make this world a better place feel this way from time to time. The only way we can ever win is to find our inspiration, take a big breath, and keep going the best we can no matter how hard it is. I know how frustrated I get on a daily basis and wonder what kind of a difference I actually make, but I do know the power of our collective voice. @Detox Diva - I remember years ago the news would report that xyz food would give you cancer and then months they would report that it doesn't give you cancer it helps prevent it. Super frustrating! @Brenna - I 100% agree about our collective voice.